Looking ahead to 2016, Mongolia’s government publicized a series of major developments in its large state-owned mining projects of Oyu Tolgoi (OT) and Tavan Tolgoi (TT), which could pull the country’s battered economy out of its downward spiral of disappearing foreign direct investment (FDI) and falling GDP. On December 16, an underground development funding agreement for the OT gold, copper and silver mine was signed, in Ulaanbaatar, with representatives of Mongolia, Rio Tinto, Turquoise Hill Resources (THR) and international financial institutions to provide $4.4 billion for a second phase of development over the next 5–7 years (Montsame.mn, December 18, 2015). One week later, it was announced that coal extraction had resumed at TT’s Eastern Tsankh section, following a one-year break. During that time, the government had renewed its contract with TTJV, a Chinese company, and settled a contentious labor dispute with on-site workers after their trade union leader publicly set himself on fire to protest the transfer of workers to TTJV (Shanghaiist.com, November 19, 2015; Montsame.mn, December 4, 2015). Mining Minister Rentsendoo Jigjid gave a positive spin, on December 18, to the parliament’s 2015 mining reforms, and reiterated that all pertinent laws on OT would be followed and that regional development, job creation and domestic companies would be promoted (Montsame.mn, December 18, 2015), Nevertheless, remaining OT and TT difficulties likely will block substantive progress prior to Mongolia’s June parliamentary elections, which is exactly what the present Mongolian government—locked in a constant political struggle with the legislature—wants. OT, the world’s largest copper-gold-silver mine, has a history of non-transparency, high-level corruption, and environmental and domestic political controversy. The OT Investment Agreement, signed in 2009, created a partnership between the Mongolian government (34 percent stake) and THR (then known as Ivanhoe Mines, with 66 percent). Rio Tinto eventually took 51 percent control of THR. OT’s first phase open pit is currently in operation, but its second phase requires construction of a 200-kilometer tunnel, with completion expected in 5–7 years. In 2009–2014, the OT project attracted $7.9 billion in FDI and paid $1.3 billion in taxes to Mongolia (Montsame.mn, December 18, 2015). The just-announced OT Underground Mine Development and Financing Plan involves funding by international commercial financial institutions and export credit agencies, along with 15 commercial banks (providing a total of $2.34 billion) led by BNP Paribas. Initial Senior Loans will total $4.4 billion, funded by Export Development Canada (EDC), the European Bank for Reconstruction and Development (EBRD), the International Finance Corporation (IFC), the United States’ Export-Import Bank, and Australia’s Export Finance and Insurance Corporation (EFIC) (Mongol Messenger, December 18, 2015). At the signing ceremony, Mongolian Prime Minister Chimed Saikhanbileg proclaimed, “Starting today, the OT project becomes a pure business project. The project is no longer a political or government issue” (Montsame.mn, December 18, 2015). However, stage two development involves overcoming several key hurdles, which the Mongolians know will lead to further delays. Rio Tinto still must update the feasibility study with revised capital estimates and secure all necessary permits. Only after these steps have been completed can the project be submitted to various approval boards, which will trigger the $4.4 billion draw down. The Mongolian government and THR have agreed to pay Rio Tinto an annual completion support fee equal to 2.5 percent of the amounts drawn, with interest-only payments for the first five years and structured on a stepped amortization schedule. Such project financing terms and timetable must be approved by Mongolia’s notoriously independent parliament, so the government wants to push parliamentary debate past the upcoming elections. Meanwhile, Mongolia seeks to increase coal production from the long-delayed TT project to overcome an immense budget gap, repay its debt to Aluminium Corporation of China (CHALCO) amid a sharp downturn in coal prices, and show new job creation. Yet TT’s exploitation remains slow in both its Eastern Tsankh and Western Tsankh sections. 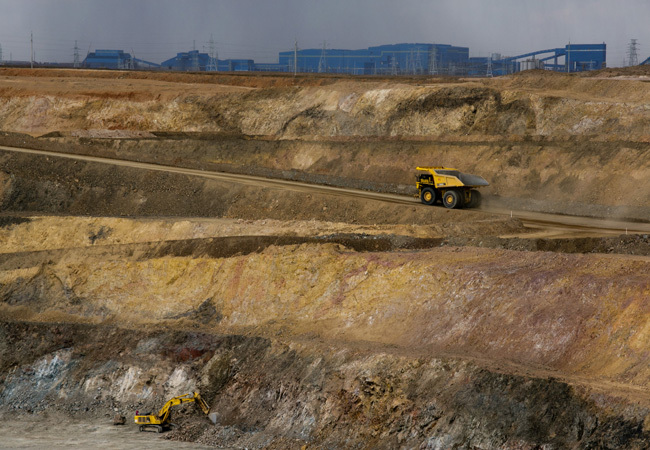 The Mongolian Erdenes Tavan Tolgoi Company (ETT) had stopped mining in the eastern tract, which produces the CHALCO coal, while renegotiating with the Chinese contractor, TTJV. Mongolian Ambassador to China Tsedenjav Sukhbaatar explained the actual circumstances of the stoppage and the slow pace of CHALCO coal repayments by noting the political considerations. Since TT is a mega project, “it requires prudence and full consideration in case more problems come out during implementation.” Sukhbaatar asserted that TT negotiations were in the last phase, but in fact dismissed the notion of a speedy resolution: “We know that due to the long negotiation, we have missed the golden era when China’s coal price was high. But considering its vast deposits, the world’s largest untapped coal mine, we still believe it is necessary to put deliberation as a priority” (Globaltimes.cn, November 11, 2015). Mongolian TT intentions were further revealed by an ETT Deputy Director discussing the remaining $115 million CHALCO debt, which is extracted under a cost reimbursable management contract with Australian company Macmahon Holdings. In 2014, when the TT extraction coal price per ton reached $44.60, there was a monitoring mechanism stipulated in the contract to halt production. After ETT cut extraction costs by over 50 percent, paying in the form of coal again became profitable, so production could resume at the end of 2015 (Mongol Messenger, November 27, 2015). However, finalization of the TT agreement for western tract development with a consortium of China’s Shenhua Energy, Japan’s Sumitomo and Mongolia’s Energy Resources remains problematic (Ubpost.mongolnews.mn, December 24, 2014). The consortium will be responsible for exploiting and selling the coal; constructing and financing a Chinese gauge railway between TT and the Chinese border port; paying the remaining ETT debt to CHALCO; and organizing an ETT share distribution to Mongolian citizens. The Chinese are frustrated that the consortium’s investment allocation process, delayed by the Mongolian side, seemingly will not be settled this spring. Furthermore, the contract for three local firms selected by the government to mine in Western Tsankh has expired, so another open tender must take place. All this suits the Mongolian government by overtly showing movement on TT while preventing the Chinese role from becoming an election issue. Meanwhile, there is real progress on a TT Russian gauge rail spur to move coal from Mongolian coal mines east and north along the Trans-Siberian Railroad to Northeast Asian clients other than China. A Japanese Ministry of Economy, Trade and Industry working group was in Mongolia on November 23–27, to visit TT and other coal mines to complete feasibility studies. Actual construction begins this spring (Mongol Messenger, December 18, 2015). The TT and OT mega projects will thus continue to prove their overwhelming strategic importance to Mongolia in economic, financial, political, and geopolitical realms.